Since 1981, Michael’s firm Michael Osborne Design has been creating some of the most memorable packaging, corporate identity, and retail design solutions for clients that include Kettle, Target, Sam’s Club, Williams-Sonoma, Brown-Forman, numerous wineries, and the U.S. Postal Service. 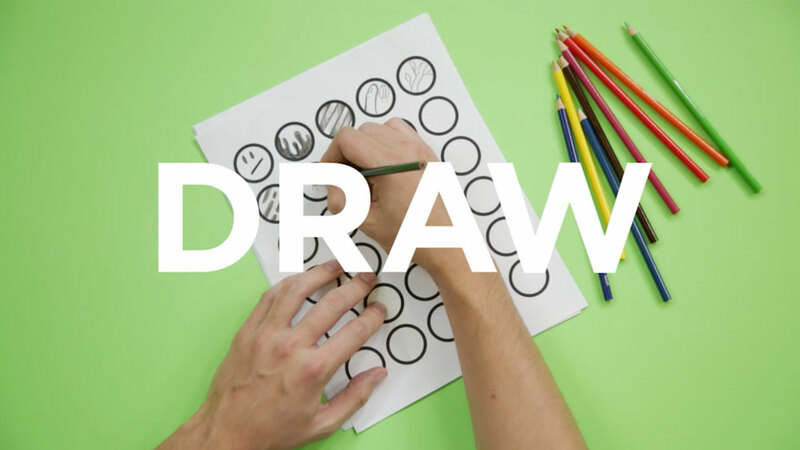 Michael has been a featured speaker at numerous conferences and design schools, and was the recipient of the prestigious AIGA Fellow Award in the summer of 2006. His work is included in the permanent collections of the San Francisco MOMA, the Cooper-Hewitt National Design Museum, and the Smithsonian National Postal Museum in Washington, D.C. Michael has also designed the 2002 and 2004 Love stamps, the 2006 and 2013 Wedding stamp set, the 2006 Madonna & Child stamp, the 2007 Patriotic Banner stamp, and the 2012 presorted Spectrum Eagle stamps for the USPS. 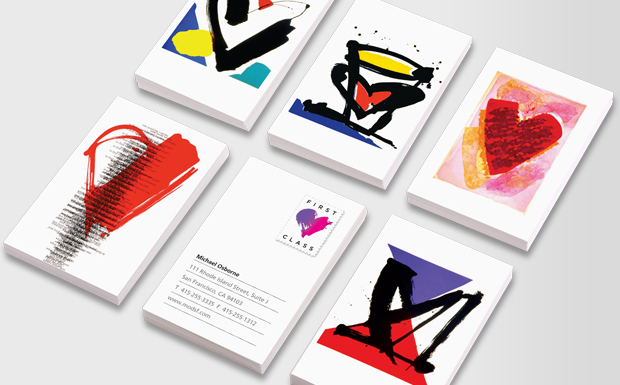 Michael received his undergraduate degree at Art Center College of Design, and his MFA at the Academy of Art University, where he has taught Package Design since 1991. 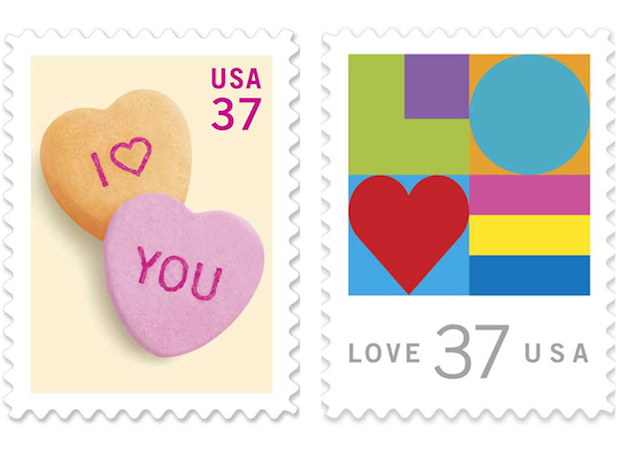 Here, we talked to him about designing the LOVE stamps, his legacy — and his own Valentine’s Day tradition. 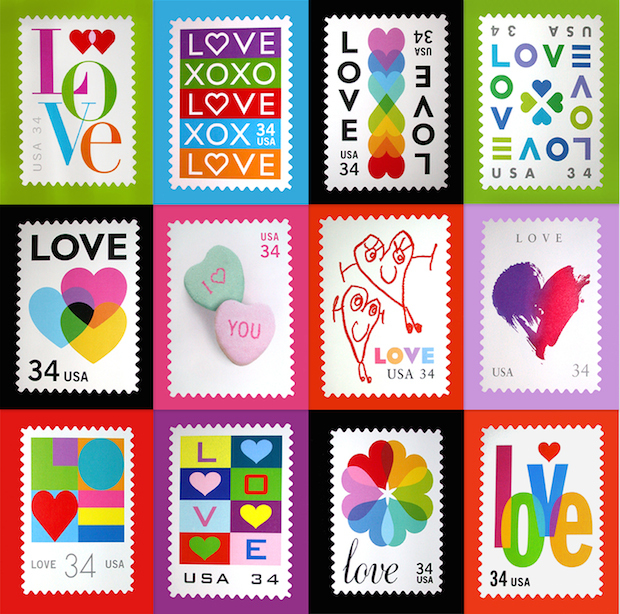 You’ve designed the LOVE stamps for the US Postal Service, what was that experience like? When I got back from lunch one day my receptionist told me that I had gotten a call from “this lady” at the post office– which I totally ignored and went to my desk. The next day, Kim rings me and says that it’s that lady from the post office again and she told me to tell you that you really need to take this call. I thought maybe we hadn’t been paying our meter or someone sent drugs somewhere in my name and I was going to jail. It was Ethel Kessler from the U.S. Postal Service, not the post office. She introduced herself, told me she was an Art Director for USPS and said, “I think I’m about to make your day.” I really had no idea what was happening so I said, ok let me have it. It was very therapeutic drawing the word LOVE over and over and over all day long. I put a book together of 14 design directions including my sketches, 400% and 100% print-outs of the final designs, and a cut out version placed in the upper lefthand corner of a letterpress printed envelope, and sent it to Ethel. Two stamps were selected from the book to produce– one for 2002, and one for 2004. I have since designed 9 or 10 stamps for Ethel who is a very good friend now. 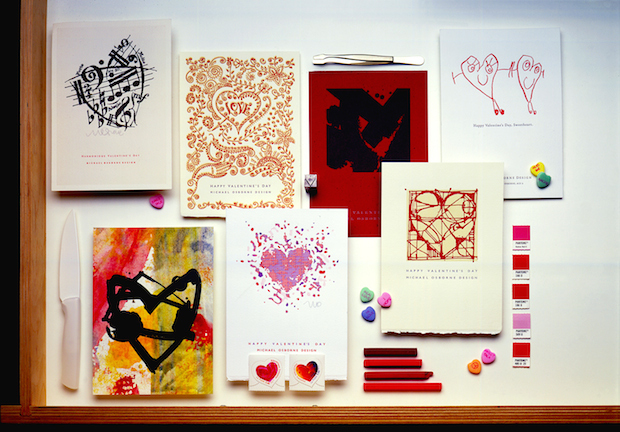 You send out beautiful letterpress valentines! Having sent out so many cards the last fifteen years, do you have a favorite? I never really have a good answer for that question. They all have something to do with whatever was going on at the time. If you started water-boarding me, I’d have to say the one featuring the “heart people.” My youngest daughter Alice was about 7 or 8 and was drawing these heart people all the time. I snuck out this drawing while she wasn’t looking. What kind of feedback to you get from the valentine recipients? For years we sent out holiday cards. We’d spend all this time and money and my hair would catch on fire trying to get these things in the mail on time. Then, we’d come back to work in the new year and I’d ask clients if they received and liked our card? Usually the answer was something like, huhhh…I think so…we got so many this year. So I started sending Valentine’s instead. EVERYONE loved them–especially designers. They were always letterpress printed at a time when there weren’t that many shops around. If we accidentally left someone off the mailing list I’d hear about it. By the way, more than one of the cards have completely vanished, all gone. 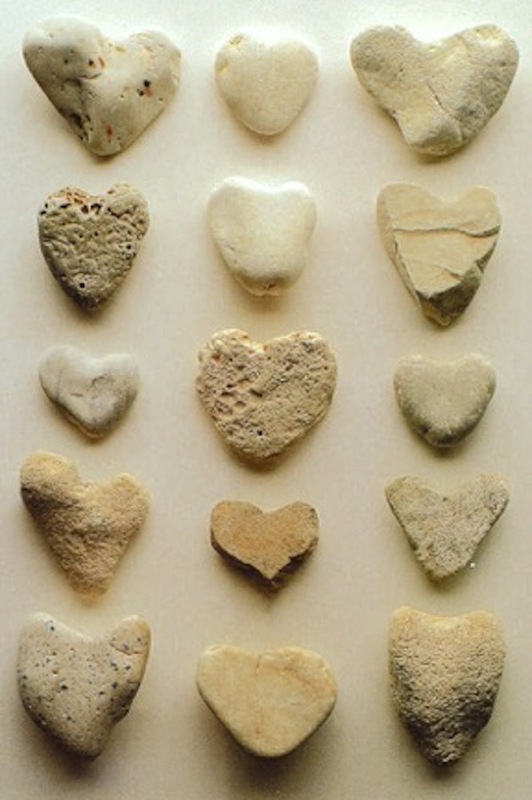 What does the valentine for 2015 look like? Ummm…I haven’t even thought about it. Plus, since I closed One Heart Press in 2012, it’s been very hard for me to consider having someone else print it. I didn’t do one for 2013 or 2014. However, when I sold some of the equipment, I bartered for some printing privileges and will do a card this year. Among designers your name is synonymous with hearts – what’s the story behind this? I dunno. Just is. 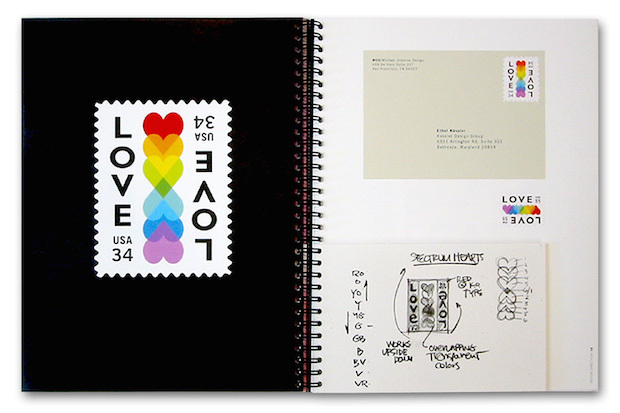 It just happens– they show up, people send rocks to me, I get projects having to do with hearts, I have a tattoo of a heart…and a young designers sent me a picture of my 2002 Love stamp tattooed in full color HUGE on her forearm! Get this…in 7th grade shop class, I made my parents a hammered-tin ashtray in the shape of a heart! How ironic. A Bodoni Is A Bodoni Is A Bodoni…Right? Lara is an accomplished designer, educator, and the head of design education at CreativeLive. She has her MFA in Design from SVA, graduated from Cooper Union's prestigious typography program, and is the author of ‘Playing with Type: 50 Graphic Experiments for Exploring Typographic Design Principles’ published by Rockport Press.